(Copyright @ 2018 by Chester B Cabalza. All Rights Reserved). Africa strongly resonates in our consciousness with aplomb visuals and grand narratives of a rich cultural heritage of the world’s cradle of civilization encrypted in the blockbuster hit Black Panther. The world’s second largest continent is home to over one billion diverse peoples and blessed with more than a thousand languages but it draws flak on its centuries-old developing economy and protracted conflicts since post-colonialism. Nonetheless this generalization was profoundly debunked in the fictional yet technologically-advanced decolonized African nation of Wakanda, whether aspired for or inspired by, it has presented a futuristic realm that paints a back story for the black’s past glory unearthed from historical accounts from the formation of Monumatapa’s civilization in Zimbabwe to Congo’s nuclear-age. Hollywood’s unforgiving representation of colors has been culturally deconstructed with the success of primarily all black cast and crew in Marvel’s Black Panther, concocted in today’s cinematic standards as classic cascading a defining moment in African-American tinseltown for an unconventional comic’s superhero. Although Africa’s astounding filmic presence subsumes a consummate appeal for royal supremacy since the mounting of the critically-acclaimed animated motion picture, The Lion King, which was obviously set in Africa, it later on adapted on stage as an award-winning musical play dominating the Broadway and West End, and popularly translated into major tongues. The two films about African anthropoid talking cats affirm innate nobility amongst the preservation of tribes and nations. And whether or not a lion or a panther king is quadruped or biped, animated or human, it still values timeless tradition and rears hominin wisdom about the serious symbol of audacious monarchy in the wilderness. Wakanda’s abundance of imagined native metal called vibranium indigenously mined around the territory’s veiled metes and bounds proves a founded wealth and innovation leading a Utopian society higher in gender equality, good governance, technological advancement, economic prosperity, endowed with philosophy of a sustainable smart city. In sum the rich nation is ahead of the curve in many aspects of human development indexes on Earth. Despite an apparent concealment of productivity, the imagined African kingdom humbly presented a sorrowful depiction of its economic status as a third world country in reaching the global community with havoc fear from foreign intervention and colonization to maintain its own striving internal security. Nevertheless the xenophobic kingdom struggles to broach itself as a committed affluent monarchical state in the community of nations as it endlessly hopes for diplomacy and international cooperation to maintain a constructed world order. But just like in any traditional monarchy, succession becomes a finite problem, and the coercion of power from potential successors that were well executed by actors Chadwick Boseman and Michael B. Jordan attest royal virtues elevating wise leadership, fortitude, patriotism and the power of love defeating greed, disloyalty, dictatorship and hatred. The universality of human values pitched in the story of Black Panther justified by the commanding presence of hip and powerhouse black characters who transported global audiences to the realm of Wakanda and to other dynamic Asian and picturesque European sets are testaments of human behaviors to present binary powers of good versus evil. 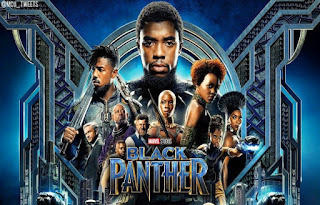 This year's Marvel movie did not disappoint avid followers, hence, it brought new life to comics-turned-feature film, enriched by colorful visuals and sound bytes dialogues, predominantly adorned by fashionable costumes and edgy editing from a visionary young African-American director, Ryan Coogler, who selflessly secured a standing ovation on its quest to unearth a proverbial African identity transforming a passé outlook about black people as Black Panther continuously paves way for a red carpet honors that Africa rightfully deserves. The clever idea on itself is a time bomb for us that Africa can reign supreme in our global village.